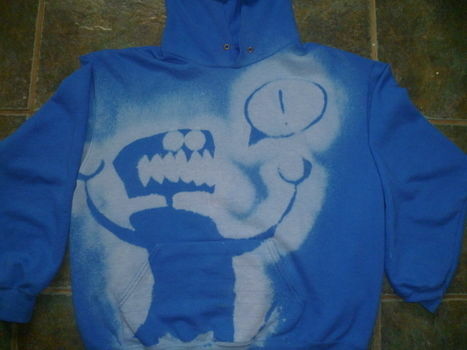 Jazz up an old plain hoodie or top by making a stencil and bleaching it! First you need to make a stencil. Make it out of card not paper because the bleach will run through the paper. Make the stencil as big and bulky as possible! Don't use small detail as it will get lost when bleached! Pull your hoodie or top over a big square of card board, roughly the same size as the top or hoodie when laid ouy flat.The card should be in the middle. The next step should be done in a bathroom. Fill a spray bottle with bleach. Lay the hoodie flat on the floor. Arrange the stencil on the hoodie you are happy with. then start spraying like mad!!! leave for around 10 minutes or until it changes colour. the remove the card and card board and plunge in a bath of water. Then take it out and leave to dry!!!! !